Join us as we dive with Lightning Box to find the Dolphin Gold, which is awaiting us on the bottom of the sea bed. Packed with colour, cute fish and even sea noises, this game is sure to delight everyone who plays. 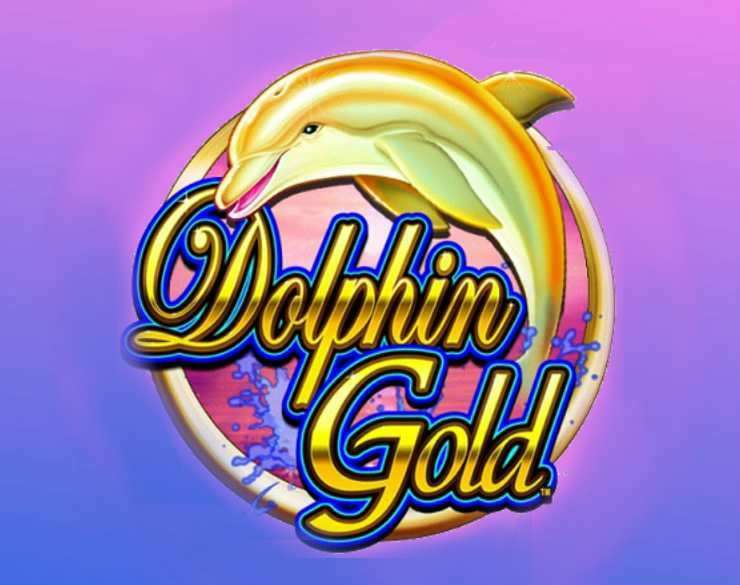 Dolphin Gold is a 5-reel, 40 pay line slot that offers players a great RTP of 96.3%. Set under the sea, the reels spin transparently against the sea bed backdrop. Surrounded by corals, anemones and with symbols all lending from the sea, Dolphin Gold really immerses you in the theme. Lots of underwater noises can be heard as the reels spin, from waves crashing to air bubbles making their way to the surface. All of which add to the atmosphere of the slot, making it very enjoyable to play. Bet Amounts – Betting begins at 1p per line in play and can be adjusted to £1 per line in play. This means that spins in Dolphin Gold can cost from just 1p per spin, up to the maximum of £40 per spin. In order to adjust your bet, you can click on the coin icon to the side of the spin button until you are happy with the bet reached. Alternatively click on the cog symbol at the top of the reels and here you can change the pay lines active as well as the bet per line. Wild Symbol – There are two wild symbols in Dolphin Gold, one of which is a blue dolphin symbol which also doubles as your scatter and the other is a gold dolphin symbol. Blue Dolphin Wild – appears stacked on reels 2, 3 and 4 only, doubles as your scatter symbol and all wins completed with this symbol will be doubled! Will substitute for all other symbols in the game. 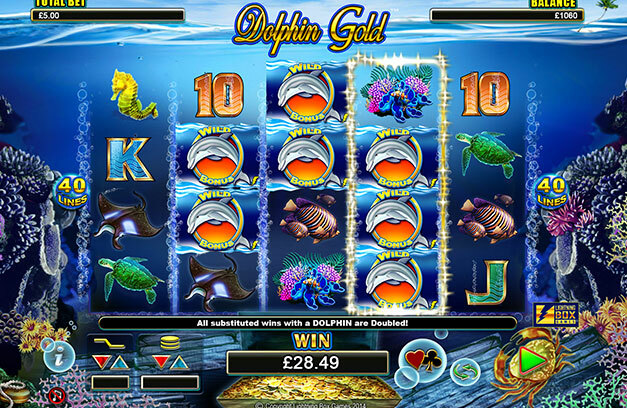 Gold Dolphin Wild – appears on reels 2, 3 and 4 in the main game but will also appear on reel 5 in the bonus game. Will substitute for all other symbols except the blue dolphin wild/scatter. Scatter Symbol – Your scatter symbol in Dolphin Gold is the same as your first wild, the blue dolphin. Land x6 or more of the blue dolphin scatter/wild symbol to trigger the bonus feature. Other Symbols – Symbols in Dolphin Gold are all sea related. With high values depicted by a range of sea animals including a manta ray, turtle, fish and a seahorse. Lower values are the usual card denominations A, K, Q, J, 10 and 9, but they have been given a fishy design looking like they have scales or gills! Bonus Spins Feature – Thanks to the dolphin wild symbols landing in stacks, it can be fairly easy to trigger the minimum of x6 scatter symbols or more to trigger the feature. Once you enter the feature you will be allocated a number of bonus spins, which is dependent upon the number of scatters you land. X12 scatter symbols will award x21 bonus spins. There is no extra multiplier here but in place of this the gold dolphin wild is now active on reel 5 as well as 2, 3 and 4, giving more win opportunities. It is possible to retrigger the bonus spins from within the round as well. It may only have one feature but it’s a great one and easy to trigger to thanks to those stacked wilds. Dolphin Gold is a simplistic game with lots to give and it’s clear that the simple layout and fast wins are the reasons players keep coming back to it for more.